The first Rain Forest Aerial Tram ever built takes you over an expansive private nature preserve on Costa Rica's Atlantic Coast. You do not have to "race" at risk or "coast" along cables or have to "fasten" mountain-climbing gear to safely explore the rainforest canopy. On board of our specially designed gondolas, you are comfortably and safely seated. With our expert naturalist guides, you will silently glide through the colorful and complex beauty of the rainforest canopy. The rainforest canopy is one of the least seen and most complex communities on the planet. In their eagerness to find light and open space, many plants have colonized the treetops, turning them into highly complex living ecosystems. Colorful flowers and an amazing array of shades of green have created a unique, symbiotic relationship with each other in order to capture precious sunlight. This beautiful world cannot be seen from the forest floor. You can still experience the canopy, however. 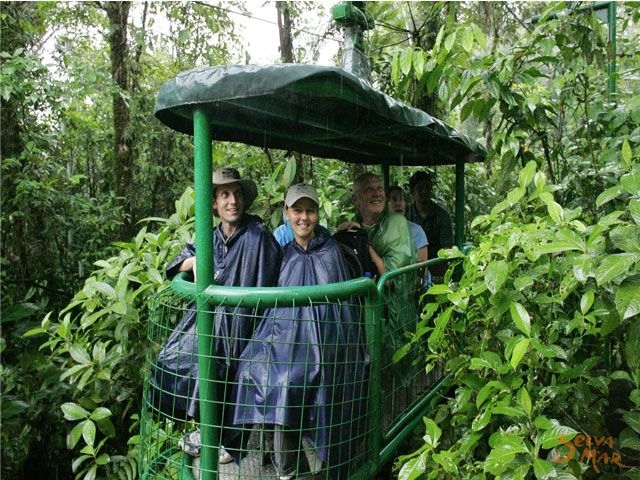 The Rain Forest Aerial Tram today offers the most spectacular way of visiting this rare world. You will enjoy the most complete rainforest experience possible, as you will literally fly through the forest, viewing the sub canopy (middle part of the forest), the upper canopy and its hanging gardens. You will discover plants and life forms that are usually hidden from the human eye in the forest treetops, opening up a little-seen world of intense beauty and an extraordinary biological diversity. Complimenting the gondola experience, you will be taken on a nature walk and enjoy an informational video, all while accompanied by a bilingual, expert naturalist guide. The Atlantic Rain Forest Aerial Tram is also home to the Rain Forest Lodge, which provides you with an opportunity to discover all the wonders of our attractions in a full-time all-inclusive way. The tour begins with a short multimedia presentation about the creation of the Rain Forest Aerial Tram. From then on, you will be able to enjoy the following attraction (please click on each attraction title to learn more about it). We show our guests all the different layers of the rainforest, from the floor up to the treetops. The latter is actually the hardest level to access and until now the least scientifically explored part of the forest. The canopy is home to an enormous amount of flora and fauna that inhabit the rainforest. Eager to find light and space, many plants have colonized the treetops, turning them into small, independently functioning ecosystems. Although wildlife is very abundant throughout the tropical rainforests, it’s difficult to spot animals during the day. Our wildlife is free to wander naturally throughout the forest, as nature intended it. Colorful tropical flowers and fascinating plants are trees are quite common, and you’ll learn how they all work together to form a complete ecosystem. This gondola tour takes place on a modified ski lift which covers a distance of 2.6 kilometers through primary rainforest. The tram ride lasts about an hour and twenty minutes and travels at the leisurely pace of two kilometers per hour, allowing you the chance to fully explore this exciting part of the forest. On our trails you can appreciate the heart of the rainforest and its abundance of plant and animal species. Here, on the forest floor, we perceive the forest in a different way: we have more time to take pictures, search for wildlife or stop to look around. A walk through our trails, along with the Aerial Tram ride, is an excellent combination to get to know and appreciate the rainforest from the ground up to the treetops. •Bocaracá Trail: This paved trail is perfect for an easy 45-minute walk. Seniors, children and people with disabilities will all find it enjoyable. Our naturalist guides lead the walks, bringing the forest to life. Rating: Easy / Duration: 45 minutes. •Las Palmas Trail: Built to prevent erosion and be accessible to most of visitors. Rating: Moderate / Duration: 45 minutes. (Not wheelchair accessible). •Del Rio (River) Trail: This 900-meter trail, located at the end of the park, gives visitors close contact with the youngest rainforest in the world. Rating: Difficult (Plenty of steps) / Duration: 50 to 60 minutes. •La Tierra de Las Ranas (Frog's Land) Trail: This specially designed trail (200 meters) allows visitors to learn about the Dendrobates Plumilio, one of the most interesting frog species in the Neotropics. Rating: Moderate / Duration: 30 to 45 minutes. •Gambas (Tower 12) Trail: After a 45-minute Aerial Tram ride, visitors can take a break by hiking a 300-meter trail, getting even deeper into the rainforest. Rating: Moderate / Duration: 30 to 45 minutes. •Pogonantha Trail: This trail is ideal for students, researchers and those who are more adventurous and enjoy discovering the forest’s deepest secrets. Rating: Difficult / Duration: 60 to 80 minutes. Accessible through a short walk, one can experience the fascination of the forest and the clear freshwater river that is filled with machacas, a local fish. This observation area consists of a tile-roofed gazebo, the perfect spot for a stretch or a welcome cocktail while being surrounded by unforgettable panoramic views. Located halfway through the gondola ride, this intimate area houses a maximum of 20 guests who will enjoy profound views of the rainforest reserve. You may enjoy the Costa Rica Rain Forest Aerial Tram Atlantic Park by purchasing a Regular Park Entrance Fee, or Full-Day Tour (which includes transportation from San Jose and lunch).